Are solar-powered chargers worth it? Head off on holiday and you'll want to take your phone, camcorder, MP3 player and maybe even a GPS unit with you. That sounds fine until you realise you'll also need chargers, all the associated cables and maybe socket adaptors, too. Suddenly, you need an extra bag to power your gear – not quite the convenient solution you pictured when you bought your gadgets. There could be a simpler way, though. Buy a solar-powered battery charger and wherever there's sunshine you'll always have a way to generate electricity. As long as the charger includes adaptors for all your gadgets, you won't need to carry anything else around, which should make your life much easier. If you're taking an autumn trip to the north of Scotland, though, sunshine isn't guaranteed. And that's a big complication, especially since most solar chargers need seven or eight hours of direct sunlight for a full charge. Still, even a few minutes might be enough to get that crucial extra shot from a camera or give your mobile the juice for a single call, which could be vital in an emergency. The most basic solar chargers can be surprisingly cheap, but read the small print carefully before you buy. We found an Exide model on sale for a mere £8.47, for instance, but it only recharges AA batteries. And while Eco Gadgets sells a more flexible charger for £16 that can handle additional battery types, and also includes "a full set of charging jacks for common small electrical appliances", it's short on details of what's supported. The real problem here is that these budget chargers normally use cheap, relatively bulky components and low-capacity batteries – fine for the home, but unhelpful if you're looking for something portable. If you want to be sure that you're buying a decent solar charger, we'd recommend avoiding the really cheap import models and opt instead for one from a well known range. Powertraveller chargers are a good place to start looking. 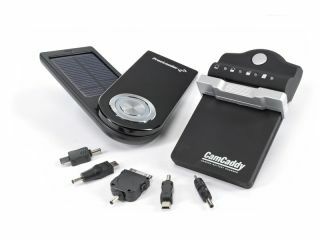 Prices start at £34.50 for the Solarmonkey – which can recharge iPods, some phones and most devices with mini USB connections – and go up to £137 for the Solargorilla, which can recharge laptops but weighs in at a chunky 820g. Meanwhile, Freeloader chargers offer strong competition. The devices' battery capacities are a little lower than the Powertravellers', but they're more flexible and can work with a greater number of gadgets. Should you buy a charger, which one is best depends on where and when you'll use it. If you're just hoping to save money, they're not worth it yet. Even if we assume a charger delivers 300 recharges over its lifetime, which is optimistic, each still costs far more than recharging your gadget from the mains. If you're a frequent traveller who'd appreciate the convenience and ability to generate some emergency power, though, buying a solar charger makes a lot of sense. We'd opt for a Powertraveller if you've got simple needs, moving to the Freeloader Pro if you need more versatility or often need to recharge a digital camera. But don't make a final decision until you've checked the small print. Each charger has its own adaptors, and it's vital to check exactly which devices they'll support before you buy.